Go home, Mitt Romney. Give it up, Fred Thompson. And John McCain, you missed your chance. In a memo and electoral maps - designed to show perceived strengths and play down others' potential - Republican Rudy Giuliani's campaign tells voters there is only one alternative to a second Clinton administration. "There is no candidate that Hillary Clinton and the Democrats fear more in the general election than Rudy Giuliani," Giuliani strategist Brent Seaborn wrote to supporters Tuesday. And he says recent poll numbers show Giuliani will be the strongest Republican candidate in the general election. A series of maps comparing how Giuliani would fare against Clinton, compared with his Republican rivals, support Giuliani's electability, he argues. One hypothetical electoral map gives the former New York mayor a guaranteed 210 electoral votes against Clinton, 60 short of what's needed to become president. Seaborn maintains that if Giuliani and Clinton go head-to-head in November 2008, Clinton will be guaranteed wins in only Massachusetts and Vermont, and will have to devote resources in traditionally Democratic-leaning state and less time in states like Nevada, Colorado and Iowa. "If Rudy is the nominee, Democrats will be forced to spend money in California, New Jersey, Connecticut, Pennsylvania, Illinois, Maryland, Michigan, New York and Washington - states that they have spent almost no money in over the last few election cycles," Seaborn writes. A Clinton spokeswoman dismissed the Giuliani campaign's analysis. Polls show Clinton leading Giuliani in many states in head-to-head contests, including their shared home state of New York. "What we're seeing across the country and in New York is that Hillary Clinton continues to beat Rudy Giuliani because he continues to embrace the failed policies of the Bush administration," Clinton spokeswoman Kathleen Strand said. Giuliani's prediction in a Romney-Clinton match assures Republicans a failure even if Romney turns every swing state projected in that scenario, the Giuliani memo maintains. A Romney spokeswoman said voters will turn away from Giuliani when they look at the mayor's complete record. "We're going to make the case to voters that Governor Romney is the best candidate who can unite the party with a focus on fiscal conservatism, strong national security policies and strong families," said," said Romney spokeswoman Sarah Pompei. 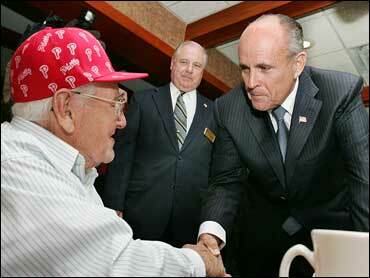 Giuliani continues to see strong national name identification. He appears about even with Romney in key voting states, such as Iowa and New Hampshire. But Seaborn focuses on a general-election strategy. The strategist goes on to predict Sen. John McCain's recent uptick has reached its end after a disastrous stretch of lackluster fundraising and staff departures. "Senator McCain has rebounded from his summer lows but seems to have a limited potential for growth," Seaborn writes, despite a new poll in New Hampshire that shows a close, three-way race for the nomination. A McCain spokeswoman said Giuliani misunderstands the electoral map. "John McCain's strong grassroots campaign is clearly gaining momentum," said spokeswoman Crystal Benton. "His consistent conservative record, unmatched experience and demonstrated broad appeal make John McCain the best candidate to win in the general election." Seaborn was less kind to another GOP rival. "We have yet to see if Fred Thompson will try to compete as a regional or a national candidate," he writes. A Thompson spokesman did not respond to a message seeking comment.